Even bringing up this issue at such a happy holiday time is difficult to do lest I be labeled some holiday-stealing grinch. But if we all take heed to what I offer here, holiday-destroying tragedy can be avoided. Some months ago I read of a shocking incident that cost two innocent lives. It was all the more traumatic because it was avoidable. A toddler child was petting the family dog, in the presence of another family member who knew the dog, and the dog attacked and killed the child. The dog was then destroyed. Neither should have died. The family knew that the dog had a history that included biting. That dog, in my view, was not vicious, but he needed help, and until he received that help, he needed to be considered dangerous to small children, and children should not have been allowed to approach him. The holidays are a time when families and friends get together. The presence of people who are not customarily part of the home scene can be stressful for a dog that has high anxiety and a lot of insecurity. Ideally, for the benefit of the dog and the safety of all concerned, that anxiety and insecurity need to be addressed and reduced or removed. Dialogue® can do that without fail. But… until steps are taken to help the dog to attain mental stability and peace, such a dog should not have to endure sudden changes to his environment, such as a social gathering, and specifically not the “threatening” spontaneity of child behavior. The owners of such a dog need to be proactive. That dog should have a well-fitting fabric muzzle as part of his equipment right along with a leash and collar. As with the leash and collar, he should become familiar with it and not fear it or view it as some kind of punishment. This applies to even the most affectionate of family dogs if that dog harbors anxious concerns about others, animal or human. Then If a situation is anticipated that is even likely to stress the dog, he should be wearing his muzzle. Drop the stigma. Muzzles are not the sign of a bad dog. They are the sign of an insecure dog who needs our help and who doesn’t want to lose his life because he behaves in a fear-driven way with his only weapon–biting. If you choose not to readily use a muzzle as I’ve suggested, you are putting your dog’s life in danger because of stresses he cannot avoid. The muzzle is to protect your dog! 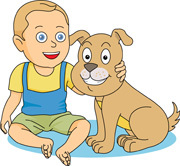 And what about the dog that has never shown anything but affection and acceptance, but who is pestered by a toddler first trying to ride him and then getting his face right into the dog’s face (something many kind dogs have trouble tolerating) so that he bit the child on the nose to back him off? I just read about such a case. Certainly less traumatic for the humans than the first incident I cited, but no less so for the dog. That dog, too, so innocent, was destroyed. His humans let him down in not controlling the child’s behavior. If a child’s behavior cannot be controlled, then that dog, too, deserves a fabric muzzle to protect him when he is around that child. Above all, this Christmas give every dog the gift of Dialogue® so that he or she can live in safety and peace and enjoy future holidays to the full.